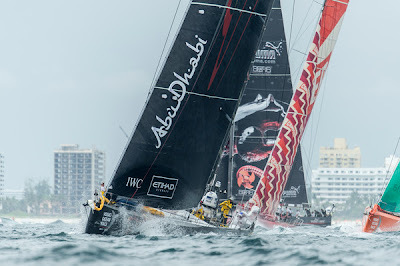 Abu Dhabi Ocean Racing launched an 11th hour comeback in the PORTMIAMI In-Port Race to take their tally of in-shore successes to three, while Groupama scored a strong second to pile the pressure on overall race leaders Telefónica. Ian Walker’s crew were rewarded for sailing a near-perfect race on Saturday when they snatched the lead from Groupama on the penultimate leg and went on to seal a dramatic victory. 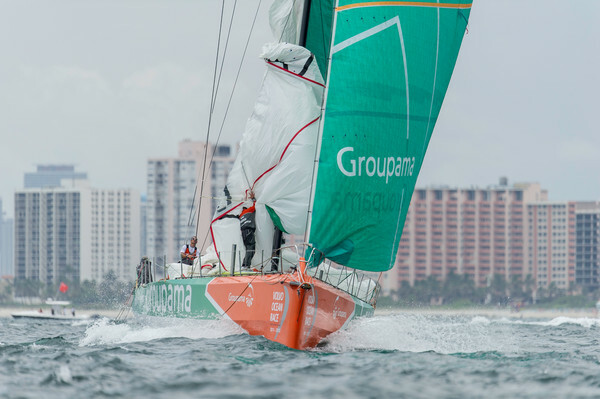 Although they were pipped at the post, Groupama’s result moves them to within just seven points of Telefónica, who had yet more in-port disappointment when a penalty for touching one of the turning marks relegated them to last place. 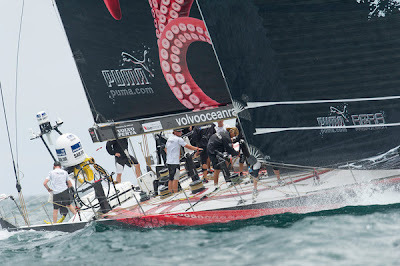 In a thrilling finale, PUMA came from behind to rocket past CAMPER into third just metres from the finish line. It was a fourth successive podium finish in the in-shore series for Ken Read’s PUMA Ocean Racing powered by BERG crew, and it brought them to within a point of third-placed CAMPER with Emirates Team New Zealand on the overall scoreboard. 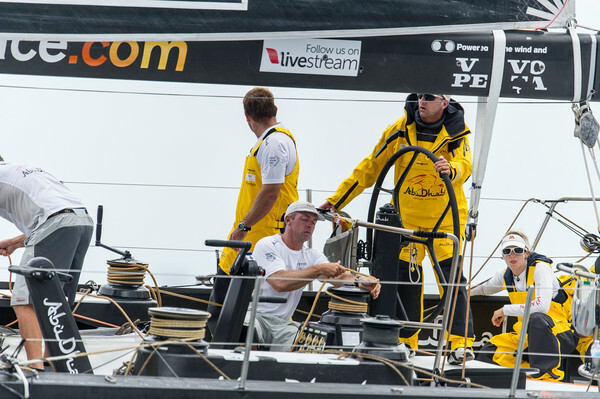 Team Sanya, the only team not racing in a new generation boat, were unlucky not to finish higher up the leaderboard, having to settle for fifth after a brave battle with their rivals. 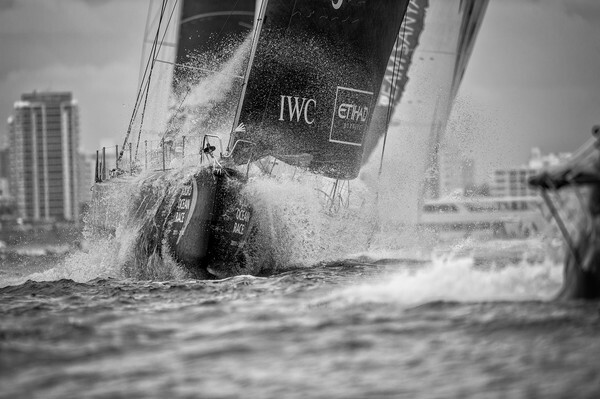 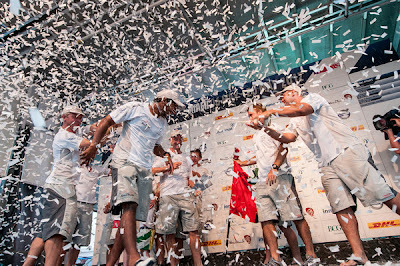 “It feels great,” said a jubilant Abu Dhabi skipper Walker moments after crossing the finish line. 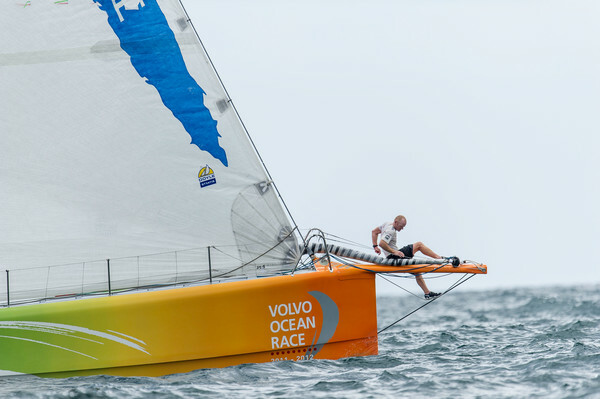 With the Volvo Ocean Race entering a critical stage with just three offshore legs and three in-port races left, just 14 points split the top four boats.Telefónica still lead with 165 points but snapping at their heels are Groupama on 158, while CAMPER and PUMA are dangerously close on 152 and 151 respectively, bolstered by the results of the PORTMIAMI In-Port Race. 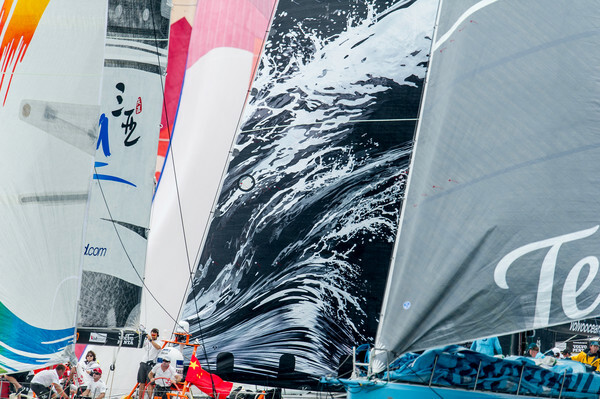 In a nail-biting contest peppered with position changes, Abu Dhabi capitalised on a strong start along with Sanya but it was Telefónica who led round the first mark, showing off their blistering speed on Leg 1. The action couldn’t have been any more intense with Abu Dhabi and Groupama overhauling Telefónica on Leg 2. 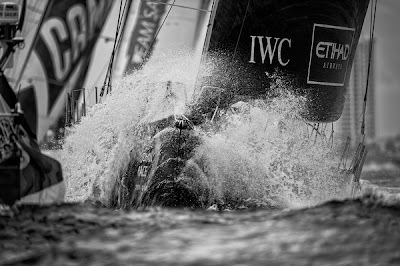 Meanwhile, after paying the price for heading offshore, CAMPER and PUMA were left desperately chasing the frontrunners. While the front two stretched their lead, a fierce battle for third developed, climaxing on Leg 6 with Telefónica hitting the mark and the rest of the fleet piling in behind. 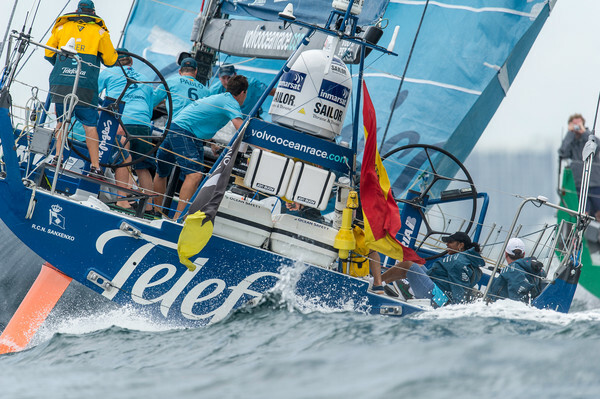 Telefónica were penalised by the on-the-water umpires, adding to their in-port misery and ending their hopes of consolidating their overall lead. Sniffing a chance to pick up crucial points, PUMA, CAMPER and Sanya put pedal to metal and launched an extraordinary comeback that brought them back in touch with then leaders Groupama and second-placed Abu Dhabi with just a few legs left. 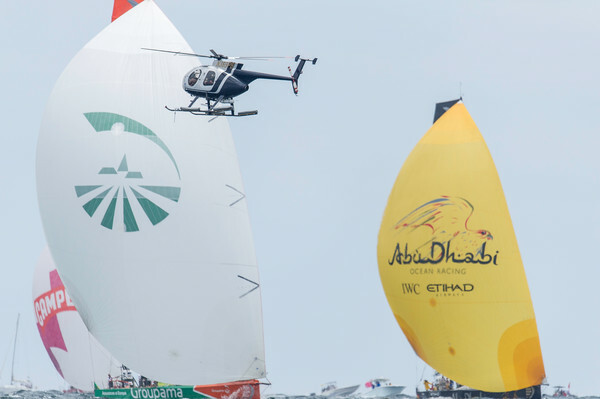 Abu Dhabi’s defining moment came when they hoisted a bigger sail than their French rivals, making the most of the smallest of speed advantages to pass Groupama despite having to dodge a spectator boat. With the breeze fading, race officials chose to shorten the course and Abu Dhabi hung on to claim the win, all the more sweet due to the fact that just a few weeks ago their stricken boat Azzam was on a container ship en route to Brazil. The sailors and shore crews are now turning their sights on the final preparations for 3,580 nautical mile Leg 7 from Miami to Lisbon, Portugal, starting on Sunday at 1700 UTC (1300 local time).